Are you ready for a new E-Team blog hop series? 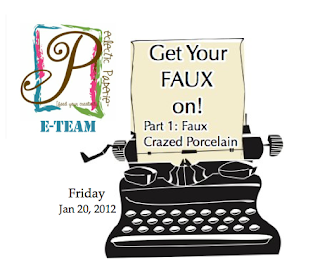 We are going to get our Faux on as we begin a new series featuring faux techniques. There are so many out there and we thought it would be fun to try them and see what we could come up with it. Visit each of the E-Team members and leave them some feedback about their creation. You can visit and leave the E-Team comments on their blogs beginning today through Sun, Jan 22nd. Winner's will be announced late Mon, Jan 23rd on the eP blog. I got out my Glue n' Seal, some Distress Crackle Paint (Rock Candy) and found something to start my project. It was fun trying to figure out what to do with this little glass bottle I bought at the craft store. My mom's birthday is this weekend so I will be giving this cute little vase to her. I think it can go on her desk and I will put some fresh daisies in it. I just have to do it, right? Playing with the Glue n' Seal was kind of addicting. It's a great medium to use as a "primer" of sorts on surfaces that just need a little teeth so you can apply something over a smooth surface. 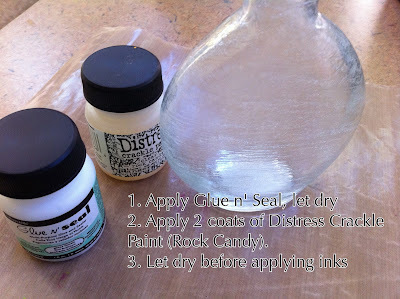 Once you get started, you'll just want to use Glue n' Seal on all kinds of clear glass or plastic surfaces. I found these glass candle votives, started to paint them, and then came up with this idea as to their purpose. With Valentine's approaches, I thought these two cute holders can sit near our family computer area when someone needs a little TLC. It is a little hard to see with the red Hershey Hugs & Kisses against the Fired Brick Distress Ink applied to the crackle paint surface. Here's another photo so you can see a little of the ink that highlights the cracks from the mediums used. 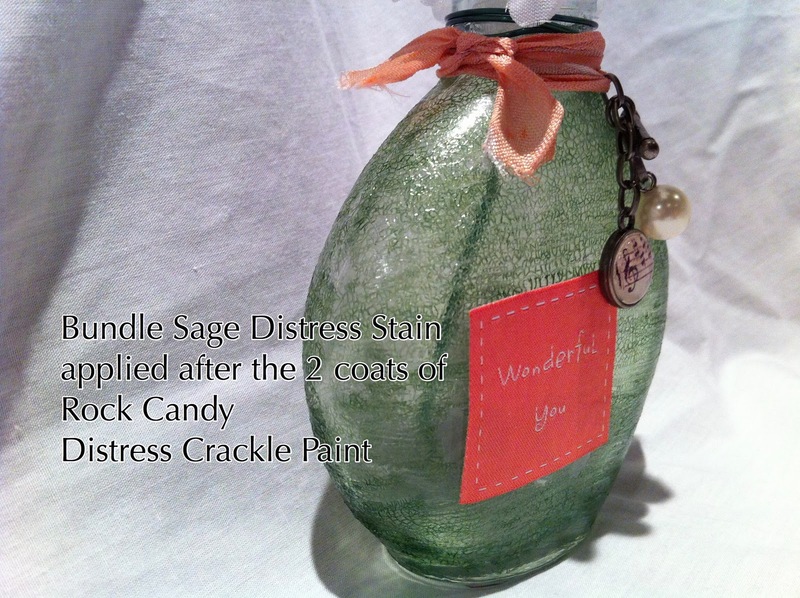 The "faux crazed porcelain" technique is really a fun and versatile way to use the Glue n' Seal and some Crackle Paint. Experiment between using inks or Distress Stains for color. You will want to see what else you can apply this medium on and try out different colors. I think clear buttons and those Starbucks Frappaccino bottles would be some good surfaces to try this techniques out. Don't forget to visit each of the E-Team ladies and their blogs to see their projects. Leave a comment here and also let me know what other "faux" techniques you would like the E-Team to feature in future E-Team Blog Hops. Love your vase, and votives. The green looks very pretty, a great gift for your Mom! Love the color over the Rock Candy. These projects are fab! Pretty vase! Yummy votives. Your E team hops are so inspiring! Thanks! Looks like a fun project !!! Now I am off to check out all the others ! Wow! What great projects, thank you so much for sharing them. Wonderful way to add new life to the vase and votives! Great projects! Can't wait to try some of the things I've seen today. Thanks for making these blogs posible. What a beautiful vase. I really like the color. your mom will love the daisy vase. and i always need XO when i'm at the puter , just so i don't end up smashing it and stomping in the remainding bits, hey, i bet those bits would take Rock Candy really well. your projects turned out so pretty. this is a great technique. Thanks for sharing. You do the coolest blog hops...I always learn soooo much! Thank you. the bottle is darling...I've been squirreling away neat bottles for some time now... guess I'll have to buy some glue n seal! 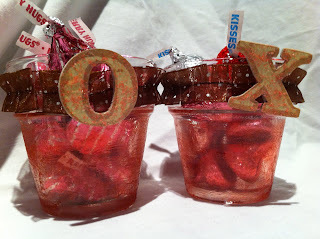 Love the green bottle and what a cute idea for valentine gifts. Love all the takes on Wendy's idea! And the colors used are super! Fabulous projects. Love this technique. What a wonderfully fun hop Daisy. I love all the projects and the technique looks great. May have to find me a bottle to play with. I love your green vase!! It looks like vintage glass!! I love both the bottle and the voltives! What a neat idea! I think I am in love with this technique. What fun! I loved your "cracked" bottle. Love the idea of coloring the bottles. I would have thought you needed to paint first and then add the crackle. I love the look and the colors you achieved! Love, love, love your vase! I need to find a small container like that!!! I will keep my eyes open! What a beautiful vase!! I love the green, and I'm sure you're mom will too!! Thanks for sharing it!! This is so unique and amazing! Thanks for sharing! Your team has done a great job, as usual! 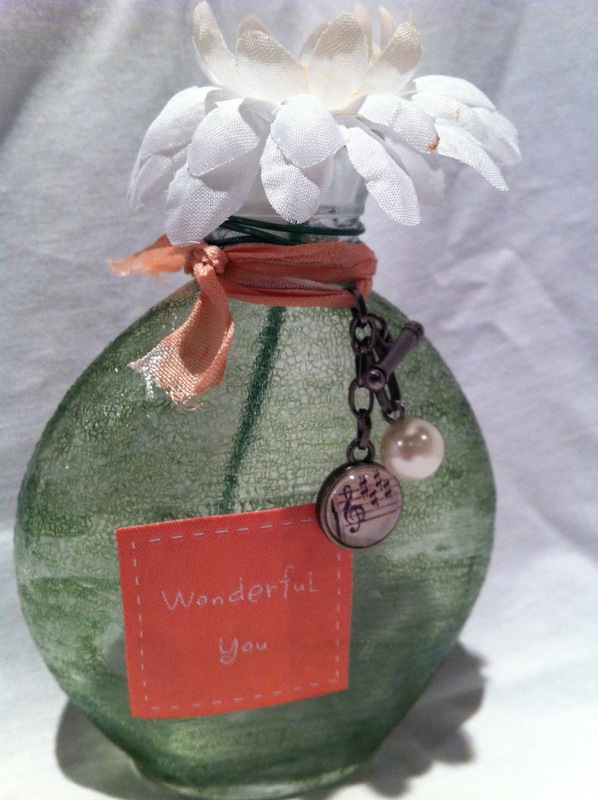 Your altered bottle is sooooooooo pretty, too! Your projects turned out great. I am anxious to start playing. What a great show/hop this has been. I love this glass piece also. Great job ladies. Both your projects turned out sooooo cute! 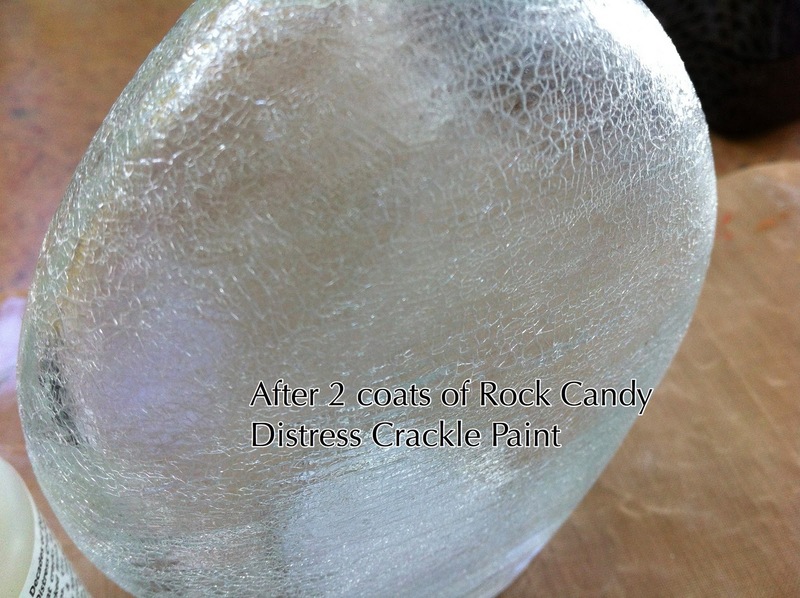 I must get some of the Rock Candy Distress Crackle paint! Wow Daisy you ALWAYS have fun stuff to get the MOJO working. I enjoy how this E-Team comes up with such fantastic displays time after time. Beautiful!!!! I especially like how the green adds to that sweet vase! This has been another amazing hop! I always look forward to seeing what your E-Team has been up to!! Beautiful vase, I sure your Mom will love it. The candle votive cups are an excellent idea for a small candy dish and so pretty! I have enjoyed visiting all the blogs. You are a very talented group of artists! Great projects. I especially love the vase. And daisies would be the perfect touch. OK I am wiping the drool off and can't wait to finish this hop and dig through the glass recycling!!! This is 'bout the funnest craftastic idea I have seen!! I looove vintage vases votives and can't wait to make! Great projects, so many great ideas! Beautiful projects! This technique is wonderful. You did a great job! 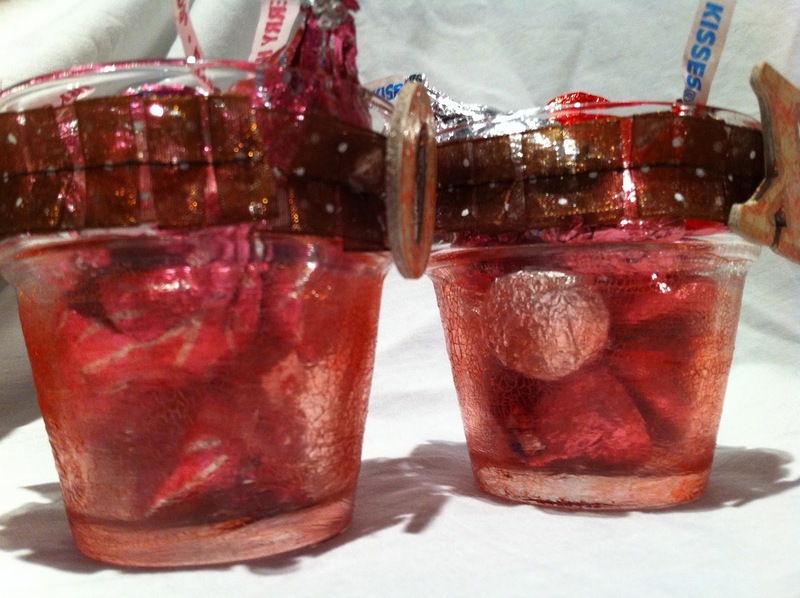 Wonderful projects- your mom is going to love hers! This was such a great hop- thanks to you all! I can't wait to try this technique. I love the red votives, so pretty. I have a fundraiser in Feburary and I am supposed to bring a few raffle items. You have given me the perfect idea. Thank you for the inspiration and opportunity to win. I LOVE it! this technique is incredible. Thanx so much for sharing! Cannot wait to try it. Just finished the blog hop..SO MANY IDEAS! I love these project. I must get some distress crackle paints. Stunning! Your mom will love the vase I think... I would! The glass really does have a crazed effect and looks real... thanks for sharing! WoW, the vase looks fantastical! As do the votives, of course ... such a great technique; can't wait to give it a try myself! The little bottle really brightened up with that simple technique. Love it. I'm on it-just washed a couple of votives yesterday.Just have to decide what color I'm going to go with. Now I have an idea what to do with all those votive candle holders I have. THANK YOU SO MUCH!!! Also thanks for the Blog Hop and a chance to win!! It certainly makes an incredible finih! I love your green vase. Your mother will certainly be happy with this gift. It is so much fun to see so many examples of this technique. You and your Design Team are amazing. Cool hop! Love the faux crazed look! Looks like a lot of fun to create these! I'm going to give this a whirl. Love the look. Thanks. fun technique - lovely projects! Fabulous!!! I love that style of bottle, and I have votive holders!!! I can't wait to try this!! So cool, I love the shape of your vase, too. I have so many glass jars, etc. - I must try this. I've wondered about faux oxidized copper??? Love the vase--it's beautiful!! Thanks for sharing!! What fun you had with that bottle.. I must try it...I love your colors too. Thanks for sharing. What a great valentines gift! I love this technique...so glad you are highlighting it this week! Cheers to a Brand New Year!